Since recorded history began, humans have sought to govern their collective behavior by organizing themselves into what we now call governments. Whether loose tribal councils and chieftains, or today’s United Nations, these socio-political creations have been a part of virtually every collection of people for countless thousands of years. The ten chapters in this module explore the evolution of political thought and reality far into the twenty-first century. Political institutions, even the very definition of politics, are undergoing massive changes today, and will continue to do so in the balance of the new century and beyond. Some of the challenges that will emerge are going to contain surprising, even shocking elements. The chapters in this module explore some of the most interesting and important aspects of those challenges. Here’s a brief list of the topics these chapters are devoted to. What is it and what role will it play in the political reality of the coming decades? The meaning of democracy is changing even today, and will change even further in the future. What forces will shape these changes? Will democracy spread around the world in the new century, and if so, how and why? Is traditional socialism the only way for people to help each other, or are there better ways that will emerge in the years to come? One of the most basic limitations on the effectiveness of any political institution is its ethics. What should we expect to change in the ethical climate in the new century? What is the real intent behind all political organization, and how will it change in the remainder of this century? We live in a world where paranoia is running rampant and unchecked. How can we move from that climate to one in which reasoned caution takes its place? There has always been a relationship between governments and the people they govern. Most have fallen into a fairly narrow range. What will happen to these relationships in the next several decades? No one really likes tyrants. But still they are around. Why? And what will happen to them in the future? Dictators are not the only form of tyranny. Any time any person or group has dominion over others, the door is wide open for tyranny. Too often they walk right through that door. What can we do to stop it? 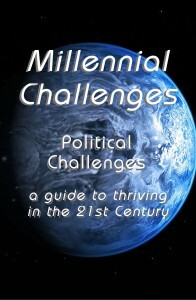 These and other important and even critical topics are discussed in this module, along with suggestions as to what individuals and governments can do to make things better as we move forward into the new millennium. If enough people take available and sensible action, we can change human life on this planet for the better, and we can start doing it today. We just need to know how. This book offers starting places. After that, you just follow your nose. To purchase an read this book click here.